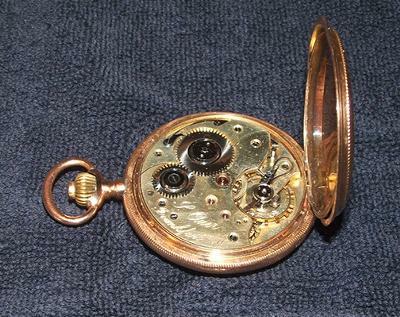 POCKET WATCH: Gold, three panel,hunter case, twenty four hour face as well as regular time. No name on the face. In side the first dust cover is two hallmarks: a crown in a circle and a star in a circle with the word monopol under it.The three quarter plate has the words...L. Auer of Frankfurt a/M. Under the front and back dust covers is the number: 181610.